Solveig Kringelborn (sop); Karl-Magnus Fredriksson (bar) (3); Roland Johansson, Lars Hammerteg (timpani) (4); Sölve Kingstedt (clarinet); Daniel Kåse (snare drum) (5). 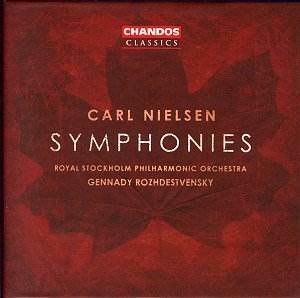 The competition for Nielsen symphony cycles has become positively murderous with all the cycles ever recorded still in the catalogue. Gone are the days when two series held sway: Ole Schmidt's for Unicorn and Herbert Blomstedt's Danish Radio six+ for EMI Classics. Of a slightly older vintage but not to be dismissed is the Bernstein/Ormandy on Sony. I love Ormandy's way with the enigmatic Sixth and the Bernstein recordings are full of character if dramatically exaggerated in the Third. For my money - and yours - the super-bargain Regis set, which is the current vehicle for the Ole Schmidt, is a best-buy, all things considered. A more mainstream choice would be Blomstedt's second cycle (San Francisco) for Decca. Spread on a rather more profligate basis there is Douglas Bostock's Liverpool recordings on ClassicO; a bit of a sleeper that one and also carrying the advantage of using editions based on the latest Nielsen scholarship. Another personal favourite is the recording on Da Capo in which Michael Schønwandt conducts the Danish Radio orchestra. Be warned though, the Da Capo set has been given a drubbing in some critical quarters. That brings us back to the present set which stands cheek by jowl with the Chandos box it was originally designed to replace - Bryden Thomson's set recorded in the 1980s. I am in some difficulty here as I have not heard that set but most critics rate it as good. Rozhdestvensky's Nielsen, or at least his Nielsen in the period 1992-94, tends towards the long steady stride. Playing times are only part of the picture but his timings are quite lengthy. You may well prefer your Nielsen this way - weighty and epic. If so, look no further. In my view, however, this languorous approach places a real strain on Nielsen�s structure and mood. In none of these works is the strain felt more acutely than in the First Symphony where punctuation and emphasis positively lumbers; where is the exultation? The Fifth Symphony, while it has some undeniably affirmative and exciting characterisation, begins to meander when it shouldn't. The other symphonies can suffer with much the same malady. There are some lovely compensations though including the lambent pastoral music of the Fourth Symphony. The cheekiness of the little marches and Varèse-like siren wails in the Tema con variazioni of the Sixth are delightful. Rozhdestvensky is good at this music which in its kaleidoscopic microcosm uncannily looks forward to the demented clockwork patter of Shostakovich's Fifteenth Symphony. The Second Symphony, in its first movement, is nowhere near collerico enough yet the lullingly unhurried allegro commodo works well even if the Andante malincolico drags. The final pages are decidedly sterterous. The prolonged andante pastorale of Espansiva is almost Delian in its progress. The voices are not given undue prominence being allowed to contribute as analogues of orchestral instruments rather than as soloists. In the finale at 2.43 Rozhdestvensky fully realises the Rimskian writing I have noticed many times before. The other major attribute of this cycle is the stunning recording quality. What a fine hall the Stockholm Concert Hall must be. It is of comparable excellence to the Concert Hall of Slovak Radio which made such an impression on me when reviewing the Marco Polo Moyzes series. While not quite as good as the results secured by the Bis engineers for Myung-Whun Chung's symphonies 1-3 and 5 these discs project a very alluring sound lacking neither in smooth refinement nor in raging impact. The gripping side drum part in the Fifth Symphony is right in your face. The other aspect is that inevitably, at this more extended pace, parts of the writing that previously faded into the background come to the surface. It is rather like a slow motion dissection of the score. Certainly you will learn more about the score, its veins, arteries and musculature. The set follows the packaging pattern set by the Naxos White Box series five years ago with three CDs each in its own sleeve. There is a decent booklet with notes by Robert Layton no less. All are accommodated in a slightly oversized box. Ultimately this is perhaps too much of a good thing and there are misfires here. The recording quality and Rozhdestvensky's ear for detail make for sometimes surprisingly pleasing listening. Not to be so easily dismissed but not a library choice either; for that I would still recommend Ole Schmidt on Regis.